Despite GGYC/BMW Oracle having had its first wish - to be CoR for AC33 - granted by the New York Appeal Court, delegates to last week's Geneva meeting could not hide their disappointment when they heard that SNG was accepting the GGYC challenge to a Deed of Gift match, rather than agreeing to either of GGYC's proposals for a multi-challenger event. 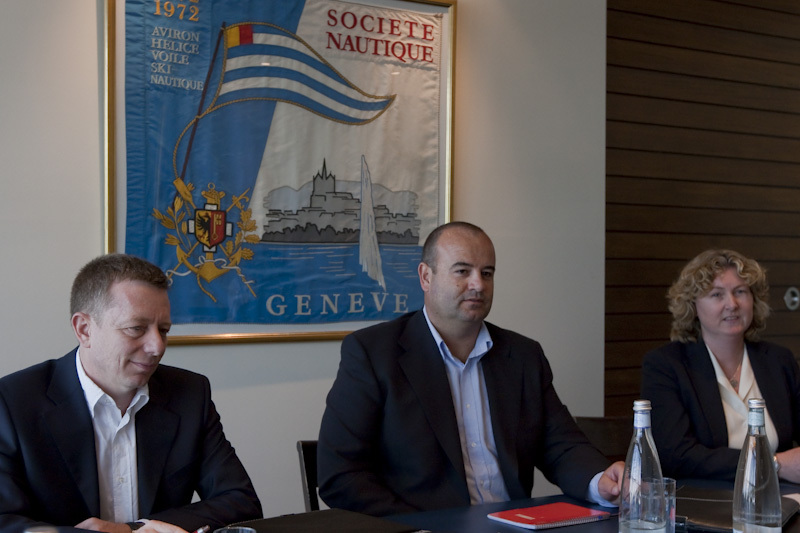 The disappointment was short lived though, for SNG quickly made it clear that they would welcome GGYC holding a Challenger Selection Series to decide which multihull would meet the Alinghi boat for the America's Cup. GGYC/BMW Oracle has been absolutely consistent on wanting AC 33 to be a multi-challenger event. 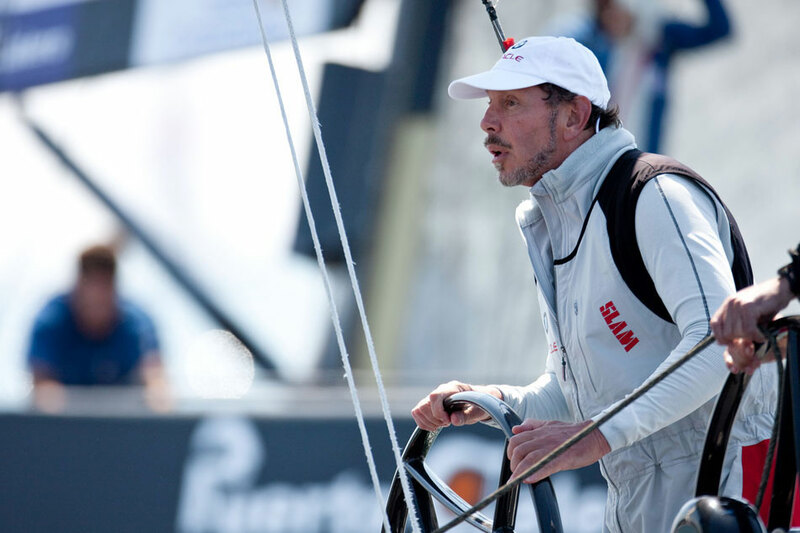 Since this saga began, almost immediately after Alinghi had won the 32nd America’s Cup, Tom Ehman has said, over and over again, that - even though it challenged Alinghi to a Deed of Gift match - BMW Oracle did not want to exclude other challengers. Indeed, in its November 13, 2008 filing to the New York Appeals Court, GGYC said “We are in no way fighting to exclude other challengers from the America's Cup, as today's SNG court brief falsely alleges. In fact, we were compelled to begin preparations for a default match in a multi-hull solely because of Alinghi's refusal to negotiate with us toward an AC 32-type protocol. 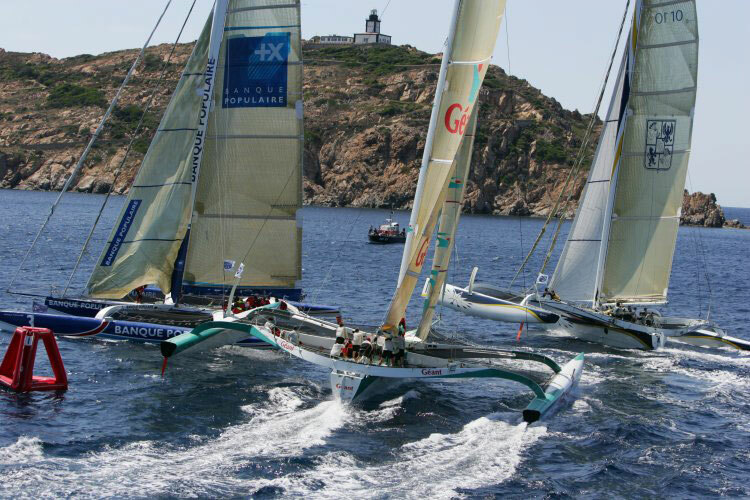 As we have consistently and publicly stated – and made abundantly clear to Ernesto Bertarelli – it has always been our intent to negotiate a conventional multi-challenger regatta with fair and competitive rules”. GGYC is now free to do exactly that, for SNG has already expressed its willingness for the challenger selection to be open to other teams and has encouraged GGYC to offer would be challengers more time to prepare if necessary. When teams that had previously entered AC33 were sounded out, to see if they would be interested in competing in a multi-challenger, multihull event, the first reactions must have disappointed BMW Oracle. 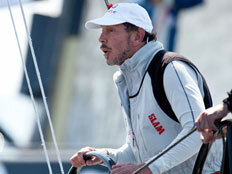 Team New Zealand’s Grant Dalton said “In practical terms it's completely impractical. No challenger will build a multihull to be involved.” Stefan Kandler, CEO of Areva, also dashed BMW Oracle's multi-challenger hopes when he said it was a waste of time trying to involve other people in a multihull race. That disappointment for BMW Oracle was, happily, also short lived for the French multihull world quickly showed that it did not share Kandler's view, with encouraging approaches coming in from French teams that already have both sponsors and boats. 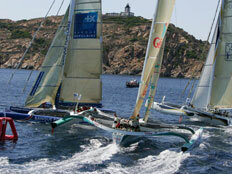 So, which French multihull teams want to compete? Understandably, nobody wants to go public until they have more details of the calendar and format that BMW Oracle has in mind for a multihull Challenger Selection Series. It is not, however, hard to identify a number of potential challengers. 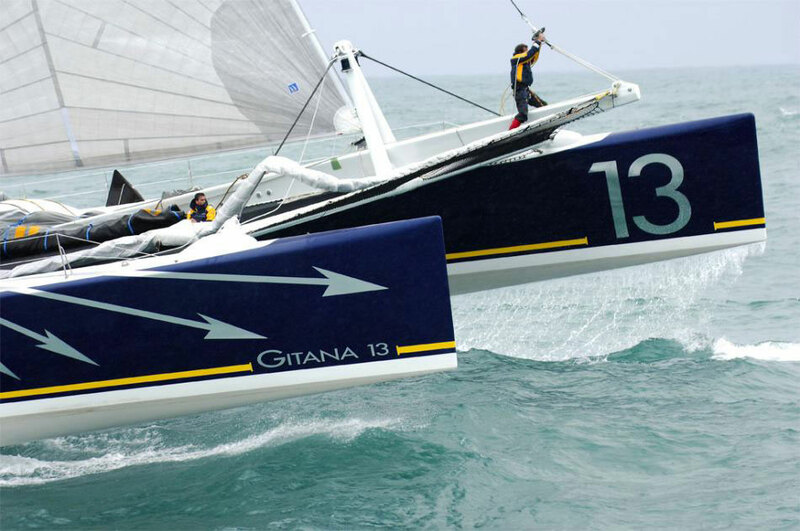 Since the demise of the ORMA series, companies like Gitana, Groupama, Foncia, Sodebo, Banque Populaire and others have one, or more of these trimarans laid up in racing trim, with no serious races to compete in except for a Transat, every so often. They would not be competitive against a boat like the BOR90 in light airs, but - with proven ocean crossing ability - they would come into their own, if ACTS were held at breezier venues. Of course, once teams know exactly what BMW Oracle's multichallenger event plans are, they may well have time to lengthen an ORMA trimaran, which would be another story. Francis Joyon is keen on an America's Cup in multihulls, saying "The idea is very interesting for someone like me who is passionate about multihulls." 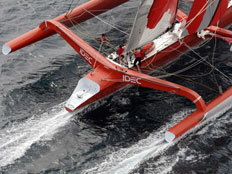 IDEC is 90 feet long, but - having been designed for single handing - it only has 520 sq mtrs of sail area. That is something that could be changed, depending on what time scale BMW Oracle decides on for a multihull Challenger Selection Series. Sodebo is 100 feet long, but conversion to yawl - with a short mast - would make it legal under the Deed of Gift. Boats with massive sail on the main mast and a tiny second mast were commonplace in the 19th century. The former Orange, ex-Innovation Explorer, one time holder of the Jules VerneTrophy, was extensively modified by Multiplast, in 2007. Like its sister craft, from the Club Med generation, Gitana 13 is 110 feet long but, like Sodebo, conversion to yawl would make it Deed legal. 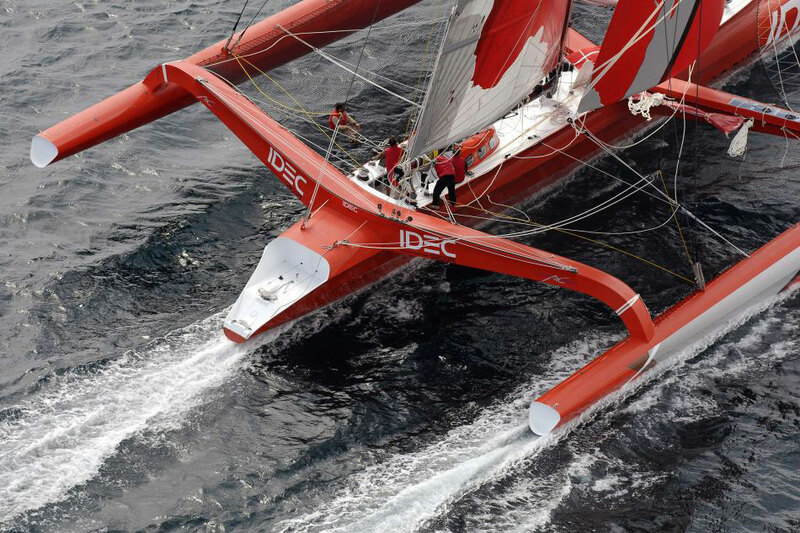 The same applies to Olivier de Kersauson's trimaran Geronimo, now outdated as far as its original purpose, which was to take the round the world record, but still a very fast boat. THE BOATS ARE OUT THERE, THE WISH CAN COME TRUE. As well as insisting, throughout the long court saga, that it wants a multi-challenger AC33, BMW Oracle has also said that it wants "fair rules for all challengers". Most of those who entered AC33, under a protocol they had worked out together, found it hard to understand why BMWO thought the rules were unfair, but that is now irrelevant. As Challenger of Record, BMW Oracle will be able to make its own "fair rules", for its own Challenger Selection Series. THE WISH HAS COME TRUE. Larry Ellison has said that he wants to see the America's Cup "follow more closely what they do in Formula 1; we�d have a regatta in Cup boats in San Francisco every year, one in Newport, one in Germany, one in Italy; regattas that people and sponsors could count on, to have some regularity." 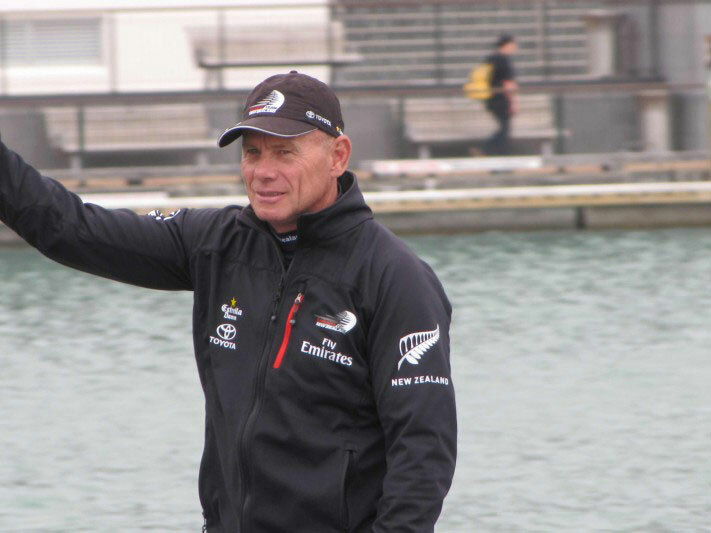 Tom Ehman has never made any secret of his desire for a more commercial, professional run America's Cup, as you can read HERE. 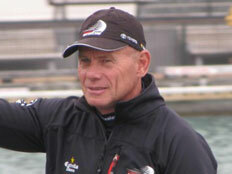 Russell Coutts, before Ellison signed him up as BMW Oracle skipper, design team member and CEO, was planning a World Sailing League in multihulls. An AC33 Challenger Selection Series could be the first step towards all those men having their wishes come true. Everyone knows what a huge success the iShares Cup has become, with spectators flocking to see the thrills and spills of high speed catamarans, racing at close quarters. You don't need a great deal of imagination to realise how the public would take to the same type of event in even bigger, faster multihulls. 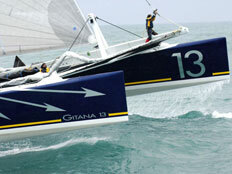 A MULTIHULL AC33 CSS IS THE FIRST STEP TO MAKING THAT WISH A REALITY. There are some who will be horrified at the idea of an AC32 style America's Cup being held in multihulls, with all the ACTS and Round Robins and spectator attraction that would go with such an event. We believe most people will welcome it and will applaud BMW Oracle for sticking to what it has been saying for the past 27 months and holding a multi-challenger event. In addition to stories in this 33rd America's Cup section, you can read stories from the 32nd America's Cup HERE. You will also find some older stories and interviews, from the last event, HERE.